Many people find themselves at Maine Medical Center at some of the darkest and scariest times of their lives. A loved one is ill or injured, possibly even fighting for their life. That’s stressful enough. But for some Maine families, an unexpected hospital stay comes with a host of other worries: Where are they going to sleep tonight? And how on earth are they going to pay for it? That’s where Brackett House comes in. We believe that financial concerns should never keep a patient and their loved ones apart. Located right across the street from the Medical Center’s main entrance, Brackett House offers affordable accommodations for both outpatients and inpatient families. Guests can stay for as long as they need to—whether that’s a couple of days or half a year. Donations to Brackett House cover stays for low-income guests who struggle to afford the nightly rate, funds for child care, transportation, and groceries, and funds for hotel stays if Brackett House is full. "My husband had a major stroke, and the first two nights he was at the hospital, I slept in my car. 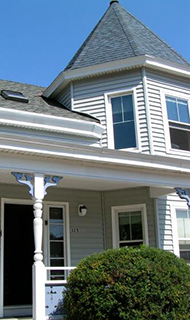 I want to thank [Brackett House] from the bottom of my heart for helping to take care of me." If you're interested in learning about sponsoring Brackett House, please contact Eliza Warren Giberson, either by email at egiberson@mmc.org or by phone at (207) 662-3829.